Our revolutionary search engine is continually learning from thousands of searches, swipes and applications. This means, you only get presented with relevant job matches to apply for jobs on the go. - Create and update your Zoek profile . Zoek Job Search app only matches you to relevant jobs from thousands of employers. No matter if you’re searching for part time jobs, temporary jobs, admin jobs, jobs in sales or jobs in retail or simply jobs near you. With thousands of jobs already on Zoek Job Search and thousands posted daily, in locations such as London, Manchester, Birmingham, Liverpool and Leeds, it's never been easier to find your next job! Zoek Job Search - Don't just search, be found. Very easy to use, as it gave me instant job results when I searched for my criteria. Applying for jobs is straightforward and I noticed that if you don’t have your CV to attached to your account, then you can fill your details in your profile and submit that as your application, which is very handy! 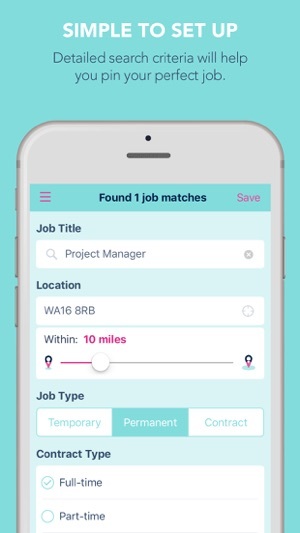 Overall it’s a good job search app as it presents relevant jobs, with a clear and easy to use application process! Would recommend this app to all job seekers out there. Highly recommend this app if looking for work. It's the only app you need to find a new job. It's easy to use. Application process is straight forward and all jobs matched are relevant.